Chevron stripes are hot on trend for the summer of 2012. This dramatic diagonal pattern has been a popular trend, seen all over fashion runways and the city streets.This print to me is so eye-catching, fresh and makes for strong statement pieces. They fall perfectly for bold prints which are strong and slimming. To flaunt this bold print with elan, I started with this gorgeous high low dress. It was LOVE and LUST at first sight. The shape of this dress is figure-flattering and adds that oomph to everyday outfit. This chevron striped dress could be worn in a variety of ways. 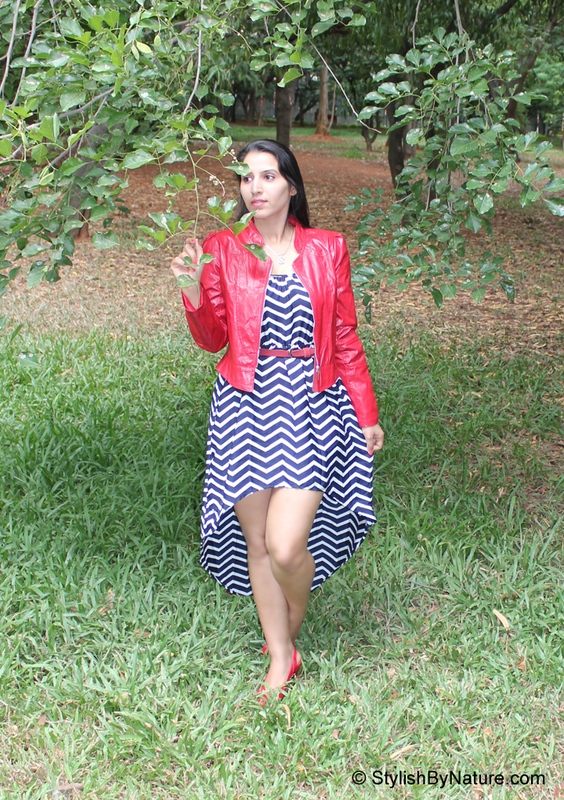 I paired my chevron with a bright pair of glossy jacket and red heels to add the pop of color. caspita che bello questo vestito e come ti sta bene!! bellissimo spezzato col rosso!!! I am obsessed with your dress and it is perfectly paired with your red jacket! CHIC! Great outfit! Love the dress! I absolutely loveee this outfit. that dress is amazing! Loving the chevrons stripes on you!! The pop of red makes it even more eye catching!!! you look lovely, omg that dress is Wow!!! red hot chilli sizzling hot awuch! see u in ur nxt post. Thank you so much for stopping by and for the lovely comment!! Love how you styled it all! Questo rosso e' davvero irresistibile!! This dress is amazing!! I love it! I love subtle matching and love how you matched the jacket, shoes and belt. little touches but they make a big difference! This dress is gorgeous with the red accessories! I love the dress! Specially how you matched it to the red details! thanks for your lovely comment on my blog, dear..
you look lovely! very cute dress and I love red on you. very pretty lipstick which shade is it? nice outfit. the red looks good on you! A perfect dress. But what would you say for the Indian ethnic dress here in this post. 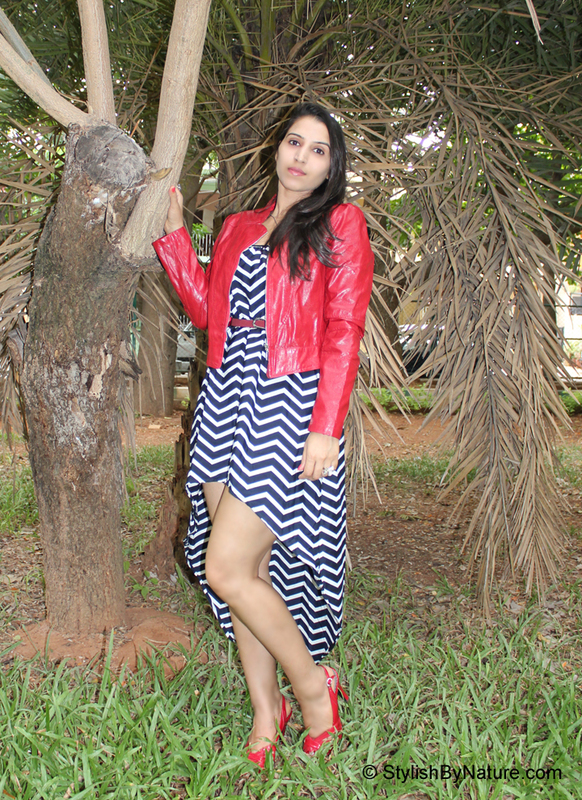 Love this chevron printed dress and the red looks amazing with it! N I must say, I've never liked a leather jacket so much as I'm liking this one.. it's so chic!!!! Im in love with your outfit ! Such a beautiful dress, you look great! I love that dresses assymmetrical shape! I can see why you love this dress....the chevron pattern rocks, and it looks great on you! Oh my! That dress is gorgeous! Looks great on you! i love the dress! especially with red! Nice "tuxedo" tail there! Lovely, dear! I really like the asymmetrical hem on your dress - your legs look amazing! CHEVRON IS VERY TRICKY PATTERN TO WEAR BUT YOU PULLED OFF PERFECTLY! The dress is so beautiful! Love the cut so much. And the red jacket matches really well. There isn't much I love more than chevron stripes and this dress is GORGEOUS! Oh dear, it's chevron and hi-low hem plus red too. Lovely look. Thank you so much for visiting my blog and commenting, it means so much! I am now following you, can't wait for more! That high-low dress is to die for! Your dress and the location are just delightful. It looks beautiful! I love how your mind works!! What a super lovely dress....all the latest trends are incorporated like the Chevron stripes, high-loW...so FAB! Looking amazing!!! Chevrons and red color make wonderful combination! Love this outfit! Dress is wonderful! Like your blog,i am following you now,hope you will follow me back? Nice post and nice dress i also like bellies of girl.